Even though it's November, the weather is great in California so we dropped the top on the appropriate car, a Ford Mustang GT/CS (the CS stands for California Special) and ran a road rallye. Ford Mustangs are assembled in Flat Rock, Michigan, where this weekend the weather is reported to be between 38 and 49 degrees and raining, not exactly convertible weather. 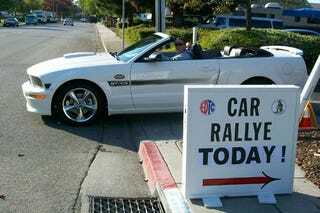 Luckily for us in California the weather is much kinder which allowed the El Dorado Touring Club and The Rallye Club to team up and put on a course marker/gimmick rallye. Before the rallye began the drivers and navigators were treated to a "rallye school" where some of the gimmicks were explained. Most rallyes have some sort of theme and this one was based on The Amazing Spiderman. That meant while we drove along the rallye route searching for course markers we would have to use our Spidey Sense. Course markers were placed on poles for teams to locate on the rallye. Once you found a course marker you would write it down on your score sheet and then receive supplemental instructions based on the letters and numbers on the course marker. This new information would send you on a detour where you may find more course markers (earning a higher score) or just get you totally lost. Somewhere along the midpoint of the rallye we ran across the checkpoint. The only problem was there sat a small pumpkin resting on the checkpoint sign. The rallye general instructions said we were to "avoid all pumpkins during tonight's rallye" which put us in quite the conundrum. Do we not go into the mandatory checkpoint? Is the pumpkin just a decoration leftover from Halloween? Why does my brain hurt? We ended up making a U-turn, finding a course marker that gave us supplemental instructions to ignore the pumpkin and then we were able to enter the checkpoint correctly. Does all of that sound a bit "fruity" to you? Welcome to gimmick rallying. At the checkpoint they gave us some new instructions (street names to remember to turn on) which we taped to the dashboard so we would hopefully remember to turn on those streets when/if we saw them. The rallye personnel also gave us something else (the best part according to my thirteen year old navigator): candy! Luckily for us he quickly began to stuff his face with his new treat and accidentally found hidden inside of some of the candy wrappers more supplemental instructions, tricky, tricky. Using the information hidden inside the candy scored us more course markers, thus earning us a higher score on the rallye (and ironically a candy induced stomach ache for my young navigator). We only had one unscheduled pit stop during the event which was due to my son sucking down more ounces of fluids than his bladder could hold. We stopped at a gas station, took care of business, checked our notes, made sure we were on course and then headed toward the finish. At the finish (which was at a local pizza parlor where a lot of beer and bench racing, or should I say bench rallying, was conducted), the rallye masters tallied our score sheet and then handed out trophies to the top finishers in each class. The El Dorado Touring Club does a great job with their trophies and they hand out a plaque for each podium finishing driver and navigator. Pretty cool since if they only handed out one trophy teams would either have to Roe-Sham-Boe to see who gets to take "glory" home (the driver or the navigator), or run that sucker through a band saw and split it in half. Half of a first place trophy just doesn't look quite right hanging on the wall. For more information on how to run a coursemarker/gimmick rallye check out the Racer Boy write up at Speed:Sport:Life.